Cloth Diapers are necessities for any parent that is why, we at Knees N Toes, offer you a selection of diapers to help you customers fulfill your needs. New considerations and evolving technologies are changing the diaper world. Cloth Diapers have grown substantially in people's attitudes. 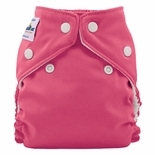 These diapers are sustainable in all ways: health, financial and environmental. There is a heightened awareness about the problems of disposables. One size diapers are adjusted by snaps or velcro, so it can accommodate infant to toddler. Some of the diapers like the GDiapers use refills that can be composted or broken up with the enclosed swisher and are flushable. Most companies offer inserts also, microfiber, cotton hemp, or overnight (which consists of 6 layers). Today's parents are looking for options that are gentle to their baby, fit their life, and are good for the planet. Are you looking forward to potty training your toddler? Then here is just the right spot. Potty training is a developmental skill that cannot be "taught" - much like walking, talking and eating solid foods. In other words, children will be potty trained when they are ready. Normal, healthy toddlers between the ages of 18 and 27 months should be physically and developmentally ready for potty training. If you have any concerns regarding your child's readiness, check with his/her pediatrician. Potties & Stools- Prince Lionheart, Mommy's Helper, Baby Bjorn, etc.